Nonprofits have been soldiering through shaky fundraising territory for the past several years. With the addition of “fear index” and “double dip” to the mainstream economic crisis vocabulary in the past few days, we can probably expect those challenges to stay around for a while and maybe even intensify. First, recognize that a lousy economy calls on nonprofits to be more than merely competent; a lousy economy challenges nonprofits to be extraordinary. And second, as you roll up your sleeves on your extremely important fall fundraising campaigns against an uncertain economic backdrop, do the one thing you can: Don’t settle for 10. Turn it up to 11. 1. Write letters, not direct mail. It’s surprisingly easy to forget that direct mail is really just a letter from one person to another. Often, the best direct mail fundraising doesn’t look or feel like direct mail at all – like a closed face envelope with an un-designed return address and an actual postage stamp. Or a letter that begins “Dear Evelyn,” not “Dear Friend.” Or a message that is driven by substance, not appearance. 2. Write emails, not eblasts. A “blast” is like dropping flyers out of an airplane – not particularly targeted, respectful or effective. When was the last time you heard someone say, “Wow, that mass email advertisement I received really made me feel special and inspired me?” It’s easy to hide behind your email marketing tools and fundraising templates. 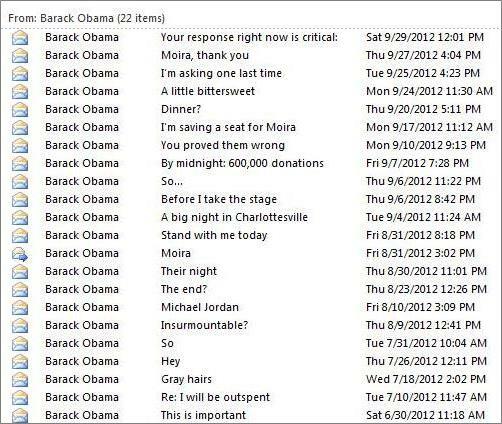 Remember that a fundraising email you send to your donors and constituents should be just as relevant, personal and carefully considered as an email that you might send from your own computer to someone you know personally. 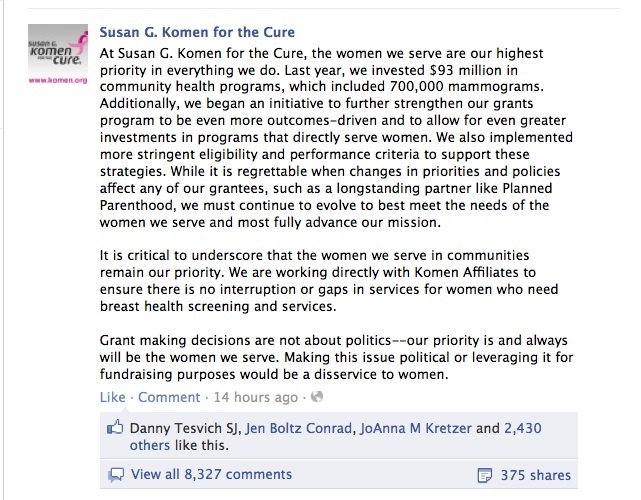 In fact, why not send your next fundraising email in plain text from your Executive Director’s actual Outlook account? 3. Give your constituents options for involvement. It’s important to recognize, create and value ways people can get involved in advancing your organization’s mission. A person may care about your issues and want to take action, but not be able to contribute financially right now. Don’t exclude them. There are plenty of ways they can help – you just need to offer them. And when an involved constituent is ready and able to give financially, you better believe that they’re going to give to the nonprofit that gave them a place at the table when they didn’t have two nickels to rub together. 4. Give your donors options for giving. A commonly used direct response ask array is 100%, 150%, or 200% of the donor’s highest or last gift amount. It’s a good upgrade-oriented ask strategy, but if not targeted appropriately, it can also be brutishly response-suppressing. Target your ask strategies by donor segment (such as current, lapsed, multi, single), and develop your ask around what you want to have happen for each particular donor segment. For instance if you are communicating with active donors who have given multiple times, then the upgrade-oriented ask array would be appropriate. However, if you are communicating with deeply lapsed donors, your immediate goal should be reinstatement, not an upgrade, in which case you may want to offer downgrade options to lower barriers to participation. And for donors who just can’t make single gifts at previous levels, now is a time to consider offering installment options. 5. 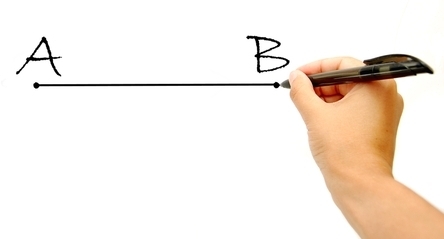 Focus like a laser on donor retention. An organization’s donors are its most valuable asset. At a time when it’s more difficult to acquire new donors, and existing donors are most likely to lapse, it’s critical to retain the donors your organization has. Because the single most significant driver of donor retention is solicitation frequency, start by examining the frequency and quality of your organization’s donor solicitations and communications. If you’re only communicating / soliciting a couple of times a year, your organization is unquestionably leaking donors. Pick up the quality and frequency of your communications to help guard against attrition. 6. Start a monthly giving program. Monthly giving programs are powerful tools for retention and upgrading. Let’s say your average active donor gives $60 a year. When they join your monthly giving program with a $10 per month pledge, they double their annual giving. And because their pledge is processed via credit card, they can remain active donors and valuable partners in your mission almost indefinitely. Monthly giving programs are a lot of work to set up and manage, and monthly donors require special stewardship – but it’s nothing your “11” nonprofit can’t handle. 7. Be brave. Are you making the same formulaic argument for support season after season? Now is not the time to blend safely into the crowd. Put yourself out there. Challenge yourself creatively and inject some standout passion, color and personality into your communications. 8. Connect, for real. Development and membership people are trained to make the case for support, to explain. But explaining to donors what your nonprofit does, why it’s important, and what you achieve can quickly turn into a one-way conversation. Instead of building your case for support around what you need from your donors, build it around your donors’ needs. Once you begin to look at your issues through your donors’ eyes you can create a foundation for genuine two-way conversation and connection. This in turn will help you build deeper more lasting relationships with your donors. 9. Get serious about multichannel and integration by getting the help you need. The statistics speak for themselves. Online giving is the fastest growing channel. (To learn more, read Convio‘s Online Marketing Nonprofit Benchmark Index Study.) The mobile web is predicted to be bigger than desktop internet use by 2015. According to analysis from Blackbaud, nonprofits that add social media communications to their constituent communications mix experience increased fundraising results. And so the advice that nonprofits hear over and over is this: if you’re not where your donors, and future donors, are then you may find yourself wondering where they all went a few years from now. But it’s not actually very helpful advice, because nonprofits already know this. The obstacle isn’t buy-in to multichannel; it’s lack of technical resources and mountains of logistical hurdles created by outdated databases and websites designed in 1997. If you have problems like getting interactive content on your website, designing, targeting and sending emails with your current system and resources, or maintaining a meaningful social media presence, then you need to solve them. A great place to begin is by joining NTEN (the Nonprofit Technology Network) which can help connect you with resources to take your nonprofit’s tech to the next level as well as a community of people who eat, sleep, and breathe this stuff – and are generous about sharing what they know. 10. Acknowledge donor anniversaries. We celebrate wedding anniversaries to affirm relationships. We celebrate birthdays to say “we’re glad you’re here.” Why not celebrate donor anniversaries – the anniversary of your donor’s first investment in your organization’s work – to send the same message? Donor anniversaries are a great opportunity to strengthen donor relationships, raise additional funds for your organization, and strengthen donor retention. 11. Think hugs not shrugs. It’s great if you were already a 10 on your donor stewardship. But in this economy you can’t give up – you’ve got to turn up the love to 11. Be positive. Share your gratitude. Say thank you in special ways. It doesn’t cost much if anything, but the rewards are great. Kudos to one near and dear organization who will, literally, be giving hugs (not mandatory!) to each and every contributor to their annual fund this year. That’s what I call 11 thinking. At the end of the day, we can’t control extraordinary economic events, but we can be extraordinary. 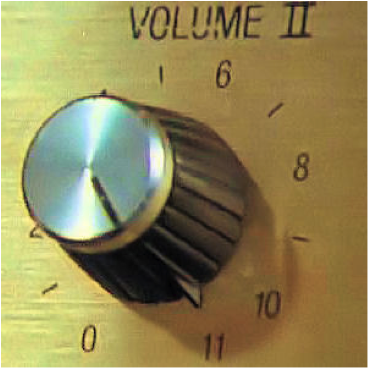 How is your organization turning it up to 11? P.S. Just for fun, identify the photo reference with this post correctly and then tell us your favorite nonprofit (and why, if you’d like) in the comments section. 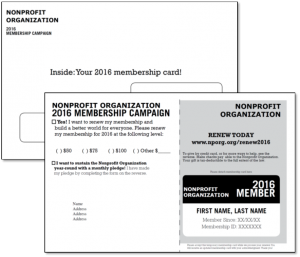 If you’re the first, The Nth Factor will be very happy to make a contribution to the nonprofit you name. The sixth annual Bridge Conference on integrated marketing and fundraising for nonprofits ended Friday, but the great content will stay with us long after. “I’ve never regretted taking the high road.” – Jocelyn Harmon, Care2 (on online etiquette). Good advice offline too. Great stuff – but a woefully incomplete list! What were your favorite comments and advice from the conference? 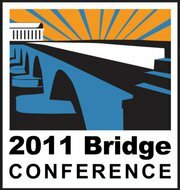 Post them here or email topics@nthfactor.com directly, and we’ll compile a complete “Best of Bridge” comments list. Looking forward to connecting! Want to get a roomful of people who work in fundraising riled up? Forget religion and politics. Talk about branding. Maybe that’s because branding is a lot like religion. And politics. It has its thought leaders, moderates, fundamentalists, left wingers, independents, evangelists…. And like religion and politics, it stands for different things for different people. Nonprofit branding gets especially controversial in direct response fundraising. A brown logo-free carrier envelope with your organization’s name and return address in Times New Roman will almost always generate a better response than a meticulously branded one. It will also almost always irritate, and possibly even enrage, your communications director. Jeff Brooks rails regularly, and rightfully so, over at Future Fundraising Now against the type of narrow branding mentality that kills direct response fundraising. But this doesn’t mean you have to violate your brand to create really good direct response fundraising. That’s because branding is about a whole lot more than logos, color palettes and font families. In fact, if your brand IS your logo, then you’re in trouble. Some think that branding is about how you present yourself. But branding is really about how people see you. Or as Amazon founder Jeff Bezos put it: your brand is what people say about you when you’re not in the room. And so in direct response fundraising, true brand integrity comes down to one simple thing: being recognizable to your donors in a way that goes far deeper than your logo and fonts. What does this mean? Well, take yourself. You don’t wear the same clothes every day. You mood isn’t always the same. You come up with new ideas and ways of expressing them. But this doesn’t prevent your friends from recognizing you and caring about you when you walk into the room. In fact, they love you. Not because you’re some vanilla version of who you think you should be for them. But because you’re you and you’re interesting. So think about – or rethink – what it means for your nonprofit to be “on brand.” Being human is a pretty great starting place. There has been a lot of talk this year from np techies to fundraising pros alike about QR (“quick response”) codes – those blocky looking codes that, when scanned by your mobile device, take you to a URL or send a phone number or text to your smartphone. 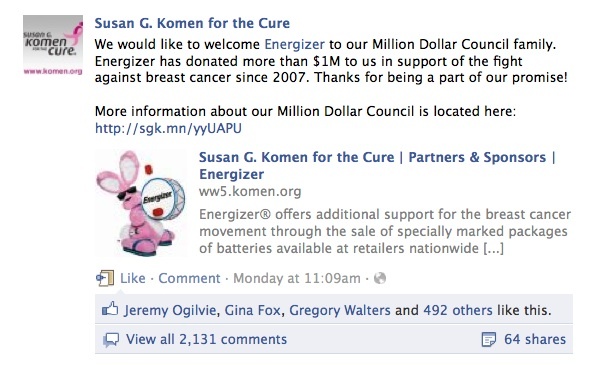 We’re seeing more and more case studies of nonprofits using QR codes to successfully mobilize constituents. And for every new case study it seems that there are dozens more ideas waiting on whiteboards everywhere. But for the most part, it needs to be said, the vast majority of our donors probably aren’t equipped to use QR codes, much less know what they are. For instance, to read a QR code, you need a smartphone. While the number of smartphone users is increasing, according to Nielsen, smartphone users currently comprise only 28% of the mobile phone market. And it’s the younger part of the mobile market. For example, half of all Andriod users are under the age of 35. Do your donors fit this profile? If you’re like most nonprofits, chances are most of your donors, and your most valuable ones, don’t. Even if you’re a donor who owns a smartphone though, you need to be sufficiently tech savvy and interested in QR codes to install a reader on your phone. Some Nokia models come pre-installed with a QR reader, but the top selling smartphones – the iPhone and Droid – don’t. At least not yet. True, readers are free, and easy to install, but again, awareness and perceived need are the crucial precursors. You know how your mother has a cell phone, but doesn’t text? Not surprisingly, 25% of U.S. smartphone users don’t even use their data service, according to another Nielsen report. Are these reasons not to experiment with QR codes in your membership program? No way. The mobile web is predicted to be bigger than desktop internet use by 2015. Though your donors may still be getting there, that’s no reason not to be ready for them when they do, or better yet, help show them the way. But you need to recognize and understand that simple fact – your donors are still getting there – so that when you do test QR codes in your own program, you do so in a meaningful way. What do you want to say? Who do you want to say it to? What do you want to have happen? And then imagine how this new medium might be uniquely helpful in achieving those goals, now, next year, and the year after. The tools of traditional offline direct response fundraising produce terrifically concrete and immediate results. We solicit our donors, they respond, we measure our results. As the name itself implies, it’s a direct, largely black and white, medium. We either meet our fundraising goals or we don’t. Direct response is an excellent membership development tool, of course. And I believe that a healthy measure of skepticism can serve us well too. But we can also benefit from approaching new prospective membership development tools with a little imagination, and a little patience. The good news is, as online constituency-building establishes its place in membership development, the direct response world is doing just this. It’s recognizing that there’s more than simply drawing a straight line from Solicitation to Gift. Our programs now embrace, or at least accommodate, the in-between state of participation – i.e. non-giving relationships centered around action, conversation, or other engagement – now made possible on a large scale online, as a deliberate first step on the path to giving. Major gift fundraising – one of the earliest forms of development to be defined as the field became organized and professionalized many decades ago – has long practiced a staged approach to fundraising that is at the heart of today’s online constituency-building strategy. Its best practitioners share a number of qualities that can be uniquely instructional to us as we shape our approaches to identifying action-takers and converting them to donors online. Major gifts people are patient. They don’t look at their watches when they’re talking to a prospective donor. They never interrupt a good conversation with an ask. Major gifts people embrace the journey. They trust that if they make it a good one, and travel with the right person, they’ll arrive at their destination. Major gifts people are strategic. They always have a plan, and they are always thinking three moves ahead. As we establish new models for direct response membership development encompassing online constituency building, let’s not forget that sometimes the most valuable models for our future aren’t actually new at all. They are alive and thriving in our present. Activism, Slacktivism or Something Else? Recently, there’s been some chatter in the press about the value of digital advocacy, including this article in the Washington Post, and this post by Foreign Policy blogger Evgeny Morozov. The term that comes up frequently is “slacktivism.” Born of “slacker” and “activism,” the term refers to supporting a social cause by taking an action that is easy to do and feels good, but is unlikely to make a difference. It could be something like signing an online petition, like the one I got a few months ago petitioning North Korea to release journalists Euna Lee and Laura Ling. It could be joining a Facebook cause. Or it could be changing your Twitter avatar green, as many did in support of this summer’s Iranian protests. Some worry that this so-called armchair activism might take the place of real activism. Rather than showing up at a local protest, or taking the time to personally call our senators, perhaps we will feel we have already done enough, just by signing this petition or joining that cause. But those concerns seem to miss the point. Do we really think that North Korea, a government known for repressing its citizens, is going to respond to a petition? Do we think Iranian President Ahmadinejad will resign if we can get #iranelection to become a trending topic on Twitter? Would we call ourselves Activists? And that’s the encouraging message for fundraisers. People really do want to change the world, to be part of a movement that makes a difference. But it is our responsibility to get people involved — through communicating the emotional impact of our work and creating easy ways for donors and prospective supporters to become engaged in our complicated causes. As we enter the fall, think about what your year-end fundraising effort has in common with the last digital advocacy campaign you took part in. If the answer is nothing, you might want to think again.